In his latest annual priorities letter to members, FINRA Chief Executive Officer Robert Cook emphasized that FINRA will be monitoring firm developments “to identify risks and assess their prevalence and impact.” He noted that the 2019 letter highlights new areas of focus that will allow member firms to determine whether certain issues “are relevant to their businesses” and how they might be best addressed. For the upcoming year, these areas include (i) the distribution of securities through online platforms; (ii) firm compliance with recently effective requirements on mark-up or mark-down disclosure for fixed income transactions; and (iii) firm use of new regulation technology (RegTech) to address compliance risks and challenges. In addition, Mr. Cook explicitly stated that these highlighted areas do not affect the ongoing monitoring and enforcement efforts detailed in previous priorities letters. In this article, Bates will review the highlights from FINRA’s newly released 2019 Risk Monitoring and Examination Priorities Letter. We once again list and compare the new priorities to preceding years in the attached Bates’ 2019 FINRA Chart.  FINRA is concerned with a host of issues tied to growth in the use of online distribution platforms used to sell and trade securities. According to the letter, FINRA will evaluate how firms that use online distribution platforms “conduct their reasonable basis and customer specific suitability analyses, supervise communications with the public and meet AML requirements.” FINRA also stated that it will review certain specific risks, including those associated with (i) offering documents or communications with the public that omit material information or may contain false or misleading statements, (ii) promises of claims of high targeted returns, (iii) sales to non-accredited investors and non-compliant escrow arrangements; and (iv) excessive or undisclosed compensation arrangements between firms and the issuers. In the latest letter, FINRA highlighted its intention to review compliance with mark-up or mark-down disclosure obligations on fixed income transactions effective on May 14, 2018. This does not come as a surprise. In its December 2018 Examination Report (covered by Bates here), FINRA found that firms were facing challenges implementing the new rules, including putting in place confirmation review processes, systems and vendors, as well as inadequate disclosure in Order Entry Systems, customer confirmations, transactions in certain structured notes, and incorrect designations of institutional accounts. In the priorities letter, FINRA stated it will review behavior to determine whether a firm is attempting to avoid their obligations concerning mark-up and mark-down disclosures. 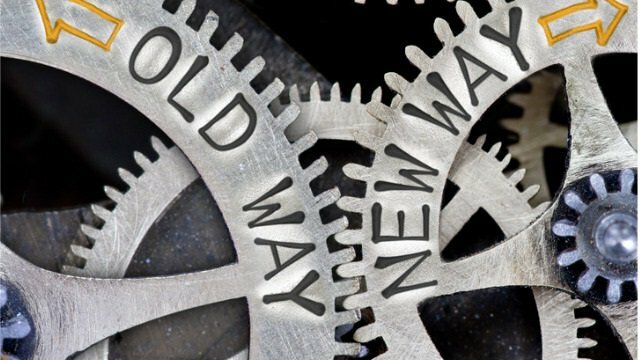 Consistent with the intent to monitor firms in order to identify new types of risk and assess their impact, FINRA stated it will use the upcoming period to examine a variety of innovative regulatory technology tools that firms are using for compliance. 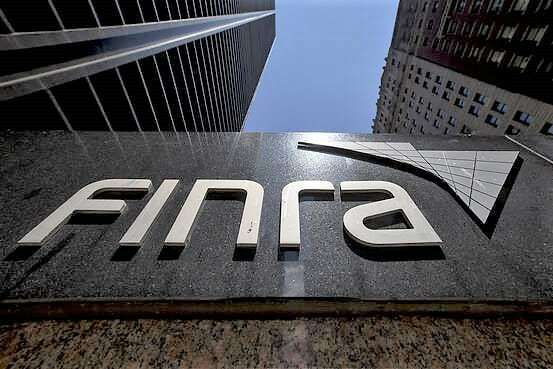 Specifically, FINRA indicated that it seeks to address risks, challenges and regulatory concerns relating to supervision and governance, third-party vendor management, safeguarding customer data and cybersecurity. 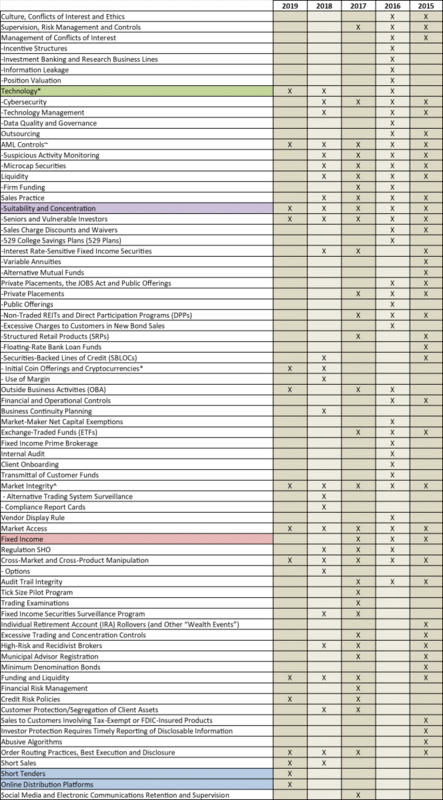 The Bates Chart above provides context and comparison for FINRA examination priorities year over year. Though there are fewer identified priorities in this year’s list, there are clearly additional nuances to many prior categories. As a result, this chart serves as a useful reference for firm compliance review. In the 2019 monitoring and enforcement letter, FINRA bundles several of these risks together into broad categories. A second category for examination includes: “Operational Risk,” under which FINRA emphasizes its interest in the supervision of digital assets. For those firms engaging in such business, FINRA makes it clear that it will consider how firms determine whether a particular digital asset is a security and whether firms have implemented adequate controls and supervision over compliance with rules related to the marketing, sale, execution, control, clearance, recordkeeping and valuation of digital assets, as well as AML/Bank Secrecy Act rules and regulations. Other operational risk concerns include examinations of firms to ensure compliance with FinCEN’s Customer Due Diligence (CDD) Rule, which went into effect last May. FINRA stated that its exams this year will focus on suspicious activity monitoring systems. Under the broad category of Market Risk, FINRA identified best execution compliance (particularly as it relates to order flow and potential conflicts of interest), market manipulation (through enhanced surveillance with an emphasis on correlated Exchange Traded Products), market access (focusing on controls and limits to sponsored access orders), short sales (examining structured aggregation units), and short tenders (including how firms account for their options positions when tendering shares). Finally, under the Financial Risk category, FINRA exams will focus on credit risk, notably, policies and procedures for identifying, measuring and managing risk exposures and the extent to which firms identify and address risks when they extend credit to their customers and counterparties. In addition, FINRA will be evaluating the adequacy of a firm’ funding and liquidity including whether firms are updating their stress test assumptions in light of increased volatility in the market and business activities and arrangements. This report evidences a shift in FINRA’s annual practice of highlighting examination priorities to alert firms to be prepared to demonstrate adequate compliance on serious issues raised in FINRA’s prior enforcement report and by newly effective regulation. 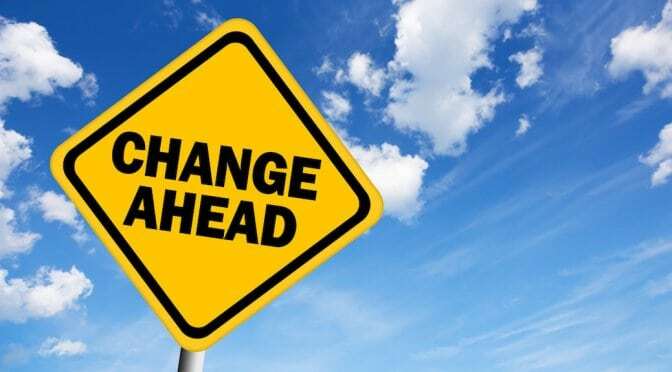 The change in the name of the report and Mr. Cook’s emphasis show that FINRA is adjusting its examination priority notice to incorporate a changing reality. In short, technology developments are moving at such an accelerated pace that FINRA must now monitor firm activity through the exam process just to better understand the nature of emerging risk and how to react to the sweeping technological change.